Aproxima-se a CRUZEX, de 18 a 30 de Novembro. 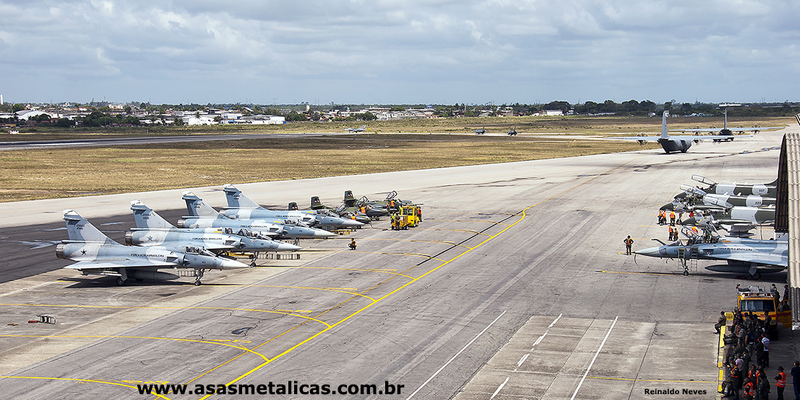 A Força Aérea Brasileira (FAB) realiza entre os dias 18 e 30 de novembro, em Natal (RN), a 8ª edição do Exercício Cruzeiro do Sul (CRUZEX). Esta edição reúne cerca de cem aeronaves de 14 países. Brasil, Canadá, Chile, França, Peru, Uruguai e Estados Unidos participarão com militares e aviões. Bolívia, Índia, Suécia, Reino Unido e Venezuela participam como observadores. Portugal trará militares de forças especiais e, ao lado de Alemanha e França, vai ministrar palestras no seminário sobre o emprego do poder aéreo em missões da Organização das Nações Unidas. O exercício organizado pela Força Aérea Brasileira permite que os tripulantes treinem o combate aéreo em operações combinadas, ou seja, diferentes nações atuando em cenários de conflito de maneira integrada e cooperativa, promovendo a troca de experiências entre os integrantes das forças aéreas participantes. “A CRUZEX permite o intercâmbio de competências operacionais. Além de estreitar os laços entre os países, possibilita agregar conhecimentos de outras nações que possuem experiências em cenários de ação conjunta”, afirma o diretor da CRUZEX, Brigadeiro do Ar Luiz Guilherme Silveira de Medeiros. Trata-se do maior exercício de combate aéreo multinacional e conjunto – pois também reúne Exército e Marinha – realizado pela FAB. Uma das novidades desta edição da CRUZEX é a adição do treinamento em cenários de guerra não convencional, no inglês UW scenario- sigla para Unconventional Warfare, onde o combate é contra forças insurgentes ou paramilitares e não entre dois Estados constituídos. Trata-se de situações encontradas em missões onde atua a Organização das Nações Unidas (ONU). Os países participantes deslocarão aeronaves de caça, como os F-16 norte-americanos e chilenos; cargueiros e reabastecedores, como os CC-130J canadenses. Os EUA participam com aproximadamente 130 militares, um reabastecedor KC-135 e seis caças F-16. A Força Aérea Chilena participa com um esforço muito semelhante: são cinco caças F-16 e um reabastecedor KC-135. A delegação, entre pilotos e equipes de manutenção, terá em torno de 90 militares. Essa é a quarta vez que o Chile participa da CRUZEX. O Peru trará quatro caças A-37 e quatro caças Mirage 2000, com uma comitiva em torno de cem militares. A França participa com um cargueiro C-235; o Canadá com dois cargueiros CC-130J; e o Uruguai com quatro caças A-37.A Força Aérea Brasileira deslocará para a Ala 10 em torno de 70 aeronaves de múltiplas aviações, além dos caças AF-1 da Marinha do Brasil, que participam pela primeira vez do exercício. post. Thanks so much and I am looking forward to touch you. I intended to put you a very little remark just to thank you so much the moment again for the pleasing techniques you’ve provided at this time. It is simply wonderfully open-handed of you to grant publicly all some people would have supplied for an e-book to help make some money for their own end, especially seeing that you might have tried it if you ever decided. The good tips likewise acted as a great way to realize that other people have similar interest just like mine to realize whole lot more when it comes to this condition. I believe there are millions of more pleasant sessions ahead for people who looked at your blog post. the views of all colleagues regarding this post, while I am also zealous of getting familiarity. Wow! This could be one particular of the most useful blogs We’ve ever arrive across on this subject. Actually Great. I’m also a specialist in this topic therefore I can understand your effort. Just wish to say your article is as amazing. The clearness in your post is simply excellent and i can assume you’re an expert on this subject. Well with your permission let me to grab your RSS feed to keep updated with forthcoming post. Thanks a million and please continue the enjoyable work. performed a formidable activity and our entire neighborhood will likely be thankful to you. Hello, yup this article is truly good and I have learned lot of things from it regarding blogging. this topic, it may not be a taboo subject but generally folks don’t discuss such issues. do with a few pics to drive the message home a bit, but instead of that, this is excellent blog. much more neatly-appreciated than you might be right now. You’re very intelligent. Its like women and men don’t seem to be interested unless it’s one thing to accomplish with Woman gaga! Hey there superb website! Does running a blog such as this require a great deal of work? in fact nice funny information too. Hello there, I found your site via Google at the same time as looking for a comparable topic, your website came up, it seems to be good. Appreciation to my father who stated to me about this blog, this website is in fact awesome. keep checking for new details about once a week. I opted in for your RSS feed too. Hello my friend! I want to say that this post is awesome, great written and come with almost all vital infos. You really make it seem so easy along with your presentation however I in finding this matter to be actually something which I think I might by no means understand. It kind of feels too complex and extremely vast for me. I am looking forward to your subsequent submit, I¡¦ll attempt to get the hang of it! I in addition to my pals were found to be going through the excellent techniques on your web blog and quickly I got a terrible suspicion I had not expressed respect to the website owner for them. Most of the men came absolutely happy to read all of them and already have quite simply been using them. Thanks for really being really accommodating and then for making a decision on such tremendous subject areas millions of individuals are really wanting to discover. My very own honest regret for not saying thanks to earlier. If you desire to get a great deal from this piece of writing then you have to apply such methods to your won website. I mean, what you say is important and all. Nevertheless think about if you added some great visuals or video clips to give your posts more, “pop”! searching for a comparable topic, your site came up, it seems to be great. I’ll appreciate if you continue this in future. A lot of other folks will probably be benefited out of your writing. After exploring a handful of the blog articles on your website, I truly like your technique of blogging. him as no one else understand such exact approximately my trouble. and in my view recommend to my friends. I’m sure they’ll be benefited from this web site.